On Nov. 22, 1968, an episode of “Star Trek” titled “Plato’s Stepchildren” broadcast the first interracial kiss on American television. The episode’s plot is bizarre: Aliens who worship the Greek philosopher Plato use telekinetic powers to force the Enterprise crew to sing, dance and kiss. At one point, the aliens compel Lieutenant Uhura (Nichelle Nichols) and Captain Kirk (William Shatner) to embrace. Each character tries to resist, but eventually, Kirk tilts Uhura back and the two kiss as the aliens lasciviously look on. The smooch is not a romantic one. But in 1968 to show a black woman kissing a white man was a daring move. The episode aired just one year after the U.S. Supreme Court’s Loving v. Virginia decision struck down state laws against interracial marriage. At the time, Gallup polls showed that fewer than 20 percent of Americans approved of such relationships. As a historian of civil rights and media, I’ve been fascinated by the woman at the center of this landmark television moment. Casting Nichelle Nichols as Lieutenant Uhura created possibilities for more creative and socially relevant “Star Trek” storylines. But just as significant is Nichols’s off-screen activism. She leveraged her role on “Star Trek” to become a recruiter for NASA, where she pushed for change in the space program. Her career arc shows how diverse casting on the screen can have a profound impact in the real world, too. 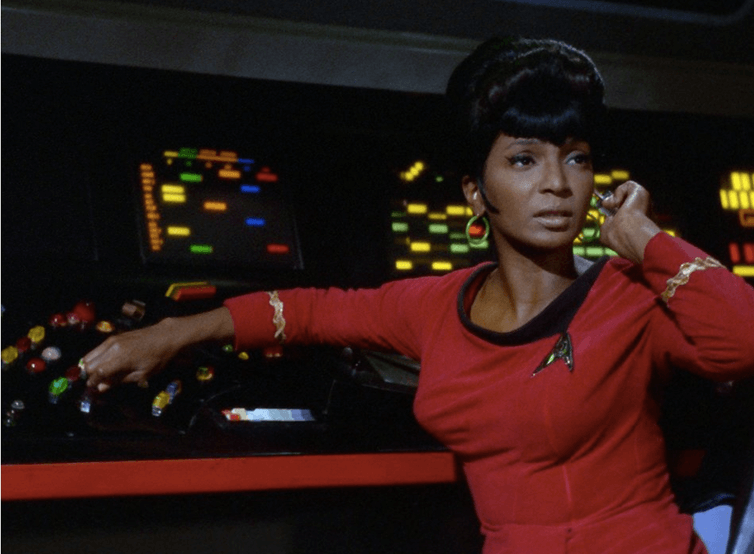 In 1966, “Star Trek” creator Gene Roddenberry decided to cast Nichelle Nichols to play Lieutenant Uhura, a translator, and communications officer from the United States of Africa. In doing so, he made Nichols the first African-American woman to have a continuing co-starring role on television. The African-American press was quick to heap praise on Nichols’s pioneering role. Yet the famous kiss between Uhura and Kirk almost never happened. After the first season of “Star Trek” concluded in 1967, Nichols considered quitting after being offered a role on Broadway. She had started her career as a singer in New York and always dreamed of returning to the Big Apple. But at an NAACP fundraiser in Los Angeles, she ran into Martin Luther King Jr.
Nichols would later recount their interaction. King went on to say that he and his family were fans of the show; she was a “hero” to his children. With King’s encouragement, Nichols stayed on “Star Trek” for the original series’ full three-year run. Nichols’ controversial kiss took place at the end of the third season. Nichols recalled that NBC executives closely monitored the filming because they were nervous about how Southern television stations and viewers would react. Nichelle Nichols recounts the reaction to filming the first interracial kiss on television. After the episode aired, the network did receive an outpouring of letters from viewers – and the majority were positive. But Nichols’s legacy would be defined by far more than a kiss. She also started to dabble in activism and education. In 1975, Nichols established Women in Motion, Inc. and won several government contracts to produce educational programs related to space and science. By 1977, she had been appointed to the board of directors of the National Space Institute, a civil space advocacy organization. Nichols’s campaign recruited several trailblazing astronauts, including Sally Ride, the first American woman in space, Guion Bluford, the first African-American in space, and Mae Jemison, the first African-American woman in space. Nichelle Nichols speaks after the Space Shuttle Endeavour landed at Los Angeles International Airport Friday in September 2012. Her advocacy for inclusion and diversity wasn’t limited to the space program. As one of the first black women in a major television role, Nichols understood the importance of opening doors for minorities and women in entertainment. Nichols continued to push for African-Americans to have more power in film and television. Fifty years ago, Nichols’s kiss may have broken an important cultural barrier. But as Nichols well knows, the quest to secure opportunities for women and minorities persists to this day – an effort that requires relentless pressure. Our new podcast “Heat and Light” features Prof. Delmont discussing this story in depth. Q&As with Jesse and Melva – When You Don’t Like the Gift!